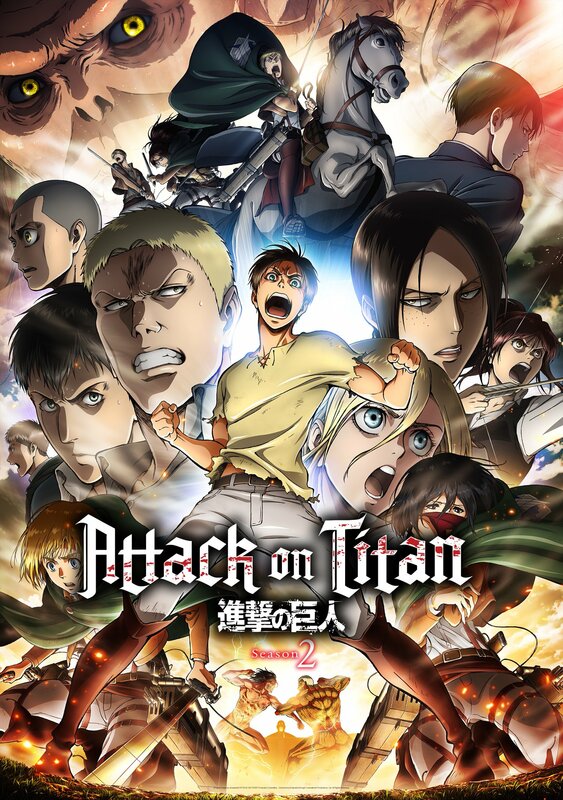 Ever since seeing the beautiful promotional poster for Attack on Titan Season 2, I jumped back onto the Attack on Titan hype train of despair and philosophy on the human condition punctuated by wonderful character moments and an epic storyline. Season 2 has been airing for about a month now, but I’ve been trying to stay away from it while in school, because I knew that once I caved and watched the first episode that I would become completely obsessed again, re-reading the manga and listening to the music on repeat all day. Well, that day has finally come. I’m completely hooked again. Do I have homework? Eh, it can wait. Do I need to be a productive human being? Oh well, Attack on Titan is calling. And part of the problem? “Shinzou no Sasageyo”, by Linked Horizon. I love this opening. It’s funny, because I first listened to it before the show aired, and thought it was fine. Beautifully animated, no doubt, and the action at the end makes me so excited for what’s coming in the story. It perfectly fits the tone of Attack on Titan for sure. But song wise? I thought it was okay. Why did I ever think that anything Linked Horizon touched would be nothing short of amazing? No idea. But what sold me on this opening was seeing it in the context of the first episode, and it was incredible. The chorus is amazing, and the entire last thirty seconds are epic and even reminiscent of Season 1’s “Guren no Yumiya”. “Shinzou no Sasageyo” is definitely just as great, and may even surpass “Guren no Yumiya” as my favorite opening to anything ever yet. This song motivates me to do insane workouts, punch naysayers, and write complicated essays all at once. When people ask me how I survived my final semester, I’ll break out singing this song, and it won’t sound pretty but I’ll try because it’s that good. Seeing this opening was the moment when I thought, “Attack on Titan is BACK!” And people said the hype was over. Attack on Titan‘s just getting started! And I for one am thrilled. So enjoy this opening as much as I do and listen to it a million times in a single night. I’ll be waiting. YES EREN BE THE GOOD PROTAGONIST YOU WERE ALWAYS MEANT TO BE!